This over-the-top deluxe collection makes the ultimate impression. 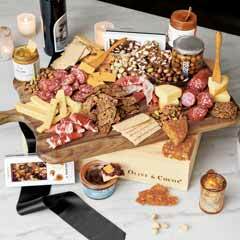 Rosemary thyme and rosemary parmesan crackers, black pepper crackers, two farmstead cheeses, hummus, sundried tomato bruschetta spread, artisan salami, Tuscan olives, jerky tenders, fruit and seed trail mix, dried apricots and figs, salted pistachios, roasted mixed nuts, wasabi cracker mix, chocolate covered caramelized almonds, chocolate dipped coconut macaroons, butter cookies, handmade sea salt caramels, Swedish fish, milk chocolate covered pretzels, dark chocolate covered almonds, two artisan cacao bars, a wooden cutting board, a serving knife and a corkscrew come gift wrapped with our signature satin ribbon and gift card in a hand crafted wood crate measuring over 2 ½ feet wide. 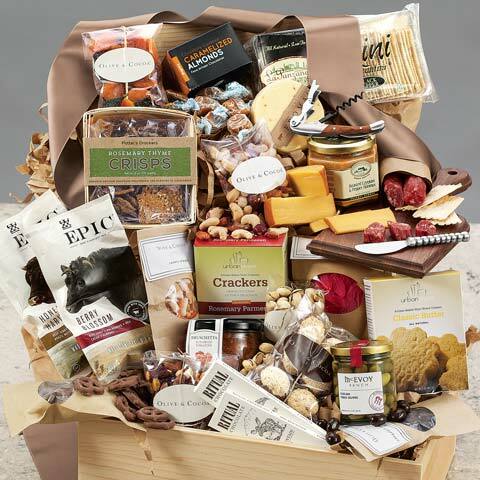 To ensure the most timely delivery of your gift, some components may be substituted for items of equal or greater value. 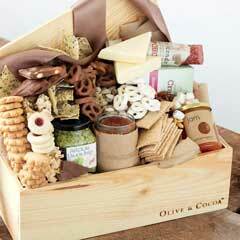 Olive & Cocoa® Signature Gourmet Collection is rated 5.0 out of 5 by 5. Rated 5 out of 5 by Sandrun from Unusual and beautifully presented baskets I purchased two baskets over the phone with the assistance of a very lovely woman. She asked me several questions about who would be receiving the basket and for what occasion. The recipients were delighted with their gifts. Rated 5 out of 5 by abeumer from Excellent Product and Customer Service Our company wanted a unique and impressive gift to send out to past and potential clients as well as esteemed business partners. 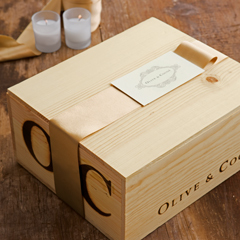 Our account representative helped us through the process of creating a brand and choosing gift boxes. The result was a very elegant and impactful gift that will not be forgotten anytime soon. Rated 5 out of 5 by pamtruax from Always the best!!!! 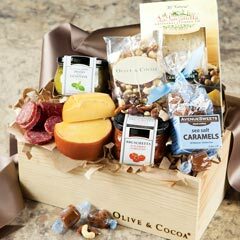 Absolutely love Olive and Cocoa!!!! Best product and presentation!! Rated 5 out of 5 by Stella from Fantastic Selection I bought this for some of my clients for the holidays and they were blown away. If you want to make a good impression this is the collection to give.